The Rapid Method is primarily a minimalist self-study approach to learn Thai online, with the occasional guidance of a teacher for practicing conversation, to check your pronunciation and to explain details and nuances. To learn a language effectively, you must develop 'muscle memory' - just like in sport, dancing or playing a musical instrument.The Rapid Method is a comprehensive system to train your brain 'muscles' and your mouth muscles to speak and understand Thai using stories, mnemonics, songs, interactivity and 'spaced repetition'. The secret ingredient is that it's all done by reading and studying (and speaking out loud and listening to) colloquial material. Thai is probably one of the simplest languages in the world to learn, primarily because it is so logical and consistent. The reason why it seems so difficult is because of how it is conventionally presented and taught. In the Rapid Method, anything that is irrelevant or redundant is omitted, so you only focus on what you need to know to be able to converse with a Thai friend. No more. No less. to learn the top 30 letters in about an hour - and be able to recognize and sound out hundreds of simple Thai words. The Rapid Method "Road Map"
Try before you buy. Sign up for the free trial version of the Rapid Read Thai online course and work through the first few lessons. You'll learn around 30 of the most common letters in a few hours, after which you can recognize and correctly pronounce (but not neccessarily understand) hundreds of basic Thai words. Learn to Read Thai. Come back and buy either the regular audio-only version of the course, or the more comprehensive "video workshop series". You can do it in a few days, but allow 1-2 months to complete this part of the process. Or if you can make it then attend one of the intensive one-week "Read Thai" bootcamps. When you complete the course you will be able to read this! Become conversationally fluent. Then if you want to have deeper and more intimate conversations with your friends and (Thai) family then buy the "fluency" course, Sydney Remember. Allow about a year to complete this course, studying two hours per week. Learn Business & Commercial Thai. If you also want to be able to talk about business, marketing or commercial issues then get the advanced fluency business course, Top Story.Allow another year, studying the usual leisurely two hours per week, to complete this course. Advanced Thai. Finally, you might want to know what's going on politically and economically in the country: study the News & Media course. Although the words used in newspapers and on the TV and radio are very advanced, there aren't that many of them and the concepts are always the same: about the government, the opposition, the protesters, murderers, thieves and terrorists, sports stars and TV personalities, floods, fires and the weather in general, etc. It's a completely different language from colloquial speech, but very easy to become familiar with if you put your mind to it. I'm developing an advanced course based on the book "Doggy-Style Politics" by Chuwit Kamolvisit (ชูวิทย์ กมลวิศิษฎ์), a maverick ex-gangster turned politician in Thailand. - includes study materials & notes, lunch & refreshments and lifetime access to online course, videos and supplementary material, and personal follow-up of your progress for a year. If you can't make the workshop then please sign up for the Rapid Read Thai Self-Study Online Course. Complete the workshop online at your convenience. All the advantages of a live workshop without the hassle or expense (just not quite as fun as learning with friends). Available for purchase now (฿14,000). What do they say in the media? Learn Thai Online, or the Rapid Method, are not mentioned anywhere on this otherwise comprehensive and resource-rich site (A Women Learning Thai... and some men too). Isn't that strange? Either the Rapid Method is so terrible that it cannot be mentioned or it is embarrassingly effective! What do you think? Warning. The marketing of this course (ebook) produced by Brett Whiteside (Learn Thai from a White Guy) can lead one to believe that it is a "rapid method" for learning Thai. He also advertises his program as Learn Thai Online so that you might inadvertently land on his page when trying to get to this site. The good mnemonics kind of peter out after about 20 letters, and they'll be described in terms of their linguistically-correct alphabet names and classes. Brett's way of figuring out the tones is also fairly ingenious (not as quick 'n easy as in the Rapid Method, though) but it still depends on the conventional class method and the somewhat inaccurate concept of high/rising/falling frequency sounds for the tones. Nevertheless, try it for yourself first if you like; and then come back and try the Rapid Method. Many who have done so already say there is no comparison! 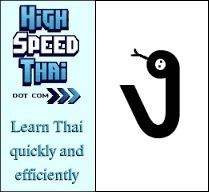 One of the key differences in our approaches is that the Rapid Method is minimalistic – you will focus only what is necessary to be able to read, speak and understand Thai, no more – while HighSpeedThai consists of about 1000 pages of material in a giant PDF file that is linked to reading and memory exercises in (an older version of) the Anki flashcard system. In the Rapid Method, I advise you not to spend more than 15 minutes per day learning Thai; in HighSpeedThai, you are encouraged to study for at least an hour a day, preferably 3-4 hours! There is a conventional reading course included in the HighSpeedThai program. And, although mnemonic pictures are used to help you remember the individual letters, the focus is on the names of the letters. งู or "ngoo" is a snake, for instance, but you can't tell from the picture that it is pronounced as "ng". Do you want to live and retire in Thailand? Contact me for a Skype consult. For English-Speaking Local Help and Expertise for foreign visitors and expats in Chiang Mai, I highly recommend Thailand Mentor for advice and assistance in finding suitable accommodation, getting the right visa, opening a bank account, getting a Thai driving license, not to mention learning important information about medical treatments, staying safe on the roads and getting appropriate insurance. Acknowledgement. I met with Stuart Jay Raj - a man fluent in over a dozen languages - when I first came to Thailand in 2005. He already had his course Cracking Thai Fundamentals and I already had the Rapid Method and we were hoping to develop a Rapid Cracking Thai Fundamentals course together. However, he got busy with other things, while I continued to develop and refine the Rapid Method over the years. The ideas for the first few vowel letters (aah, bread, bad) come from his Cracking Thai course but I subsequently changed the direction of the Rapid course by using different mnemonics and a somewhat non-linguistic approach. Stu is a true linguist and his language courses at Jcademy are remarkable journeys into Thai and related Indic/Chinese languages. I will be incorporating his suggestion to use the IPA (International Phonetic Alphabet) to help you accurately pronounce the Thai letters. But we both agree completely that the sooner you do away with any phonetic transliteration the better. Unless you are a young child, it's very difficult to learn to speak Thai correctly if you cannot read. 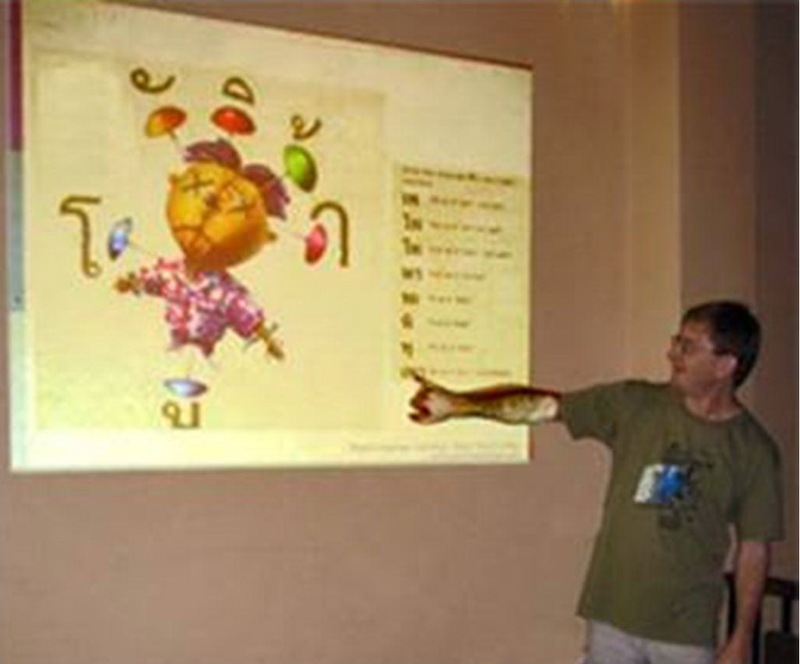 Stu's video courses cover nuances and details about Thai in a very informative and entertaining way. I will be sending you the essential video links from Jcademy to supplement the Rapid courses after you have completed the Rapid Read Thai course. For English-Speaking Local Help and Expertise for foreign visitors and expats in Chiang Mai, I highly recommend Thailand Mentor for advice and assistance in finding suitalbe accommodation, getting the right visa, opening a bank account, getting a Thai driving license, and important information about medical treatments and staying safe on the roads and getting appropriate insurance.